In less than three weeks, three children have drowned in different bodies of water in Plant City, two just five days apart. On June 17, a 3-year-old Plant City girl was found in an above-ground swimming pool. On June 13, a 4-year-old boy left the dance floor at a wedding in Plant City and was discovered in a nearby pond on the property, and on May 31, a 5-year-old autistic boy was found in a pond by the farmer’s market he was attending with his father. Now that the weather is warm, school is out and pools are open for swimming, parents should be more aware of where their children are and of the layouts of property and places they’ve never been to. According to floridahealth.gov, Florida loses more children under the age of five to drowning than any other state. The website offers easy tips to remember to keep children save. Children and adults should know when and how to call 911. There should also be someone on the pool deck that knows CPR. According to American Red Cross, children should never swim in a pool alone, and they should always swim with a buddy. Children should be taught at a young age to ask an adult before entering a pool. It is crucial for parents to watch their children at all times while swimming. 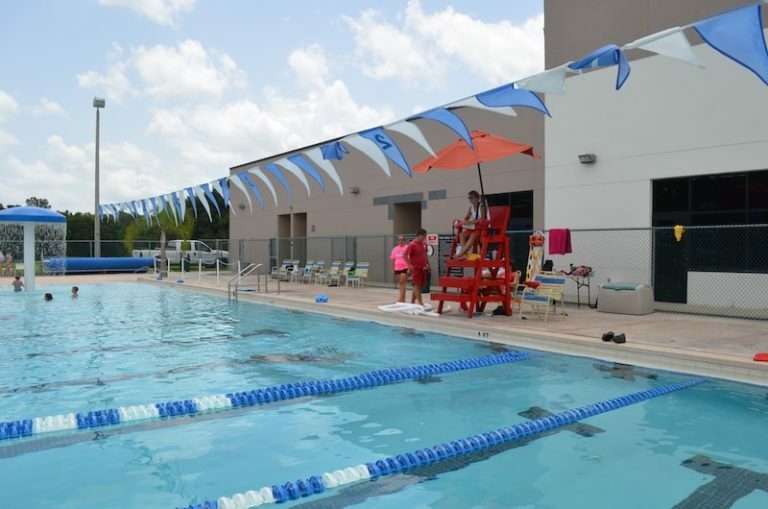 “Being in the state of Florida, we are ranked as one of the top states of drownings under the age of five, so swim safety is lifesaving,” Amanda Walker, the aquatics executive of Tampa Bay-area YMCA aquatics departments, said. At all YMCAs, there are swim tests to determine if children are capable of swimming or not. Children are asked to jump into the pool and tread water for one minute, and they are also asked to swim the length of the pool. A supervisor evaluates the child. She also suggests getting children swimming lessons at an early age so that they know what to do if they fall in a pool. If a child is to fall into a pool, they are taught to roll over and float. If they are younger, they are taught to call for help. Children are also taught a strategy called “throw don’t go.” The strategy teaches children to throw a floating object to someone who is drowning instead of going into the pool to grab them. Children are suggested to wear United States Coast Guard-approved lifejackets to prevent drownings, and parents are strongly encouraged to “have layers of protection around the pool,” according to Amanda Walker. Door alarms and pool sensor alarms are good safety tools to have at a pool, either public or private. • About 20% of people that die of drowning are children under the age of 14. • Children between 1 and 4 years old have the highest drowning rates. The Plant City YMCA offers swimming lessons to children starting at 6 months old. You don’t have to be a member of the YMCA to benefit from this lifesaving skill. For a schedule, call the YMCA at (813) 757-6677 or visit at 1507 YMCA Place.